The Monster Dash had its fair share of ghosts, goblins, and ghouls. The most terrifying of them all was the Skele-Tut. For race pictures, contact us. Tell me about your running history? Have you always been a runner? I only got serious about running this past year. My boyfriend inspired me to run with more consistency and I’ve been building on that and loving it! This year, I ran two half marathons and one full marathon. The first was the Polar Dash, Chicago Marathon, and this past race [Monster Dash]. I learned to start with a slower pace and focus on hitting a distance rather than a time. Once I was able to run longer distances, I gradually increased my speed. This helped a lot! I was too ambitious in the past, I trained way too hard, too fast. Do you train indoors or outdoors? Almost always on the treadmill. It’s helped me get a lot faster. I like the bio-feedback. You can track your speed and see how you’re improving in real-time. Even if you’re improving in tiny increments, it all adds up over time. Did you train for the marathon on a treadmill? Do you ever get bored running indoors? I got into a month long slump where I just didn’t want to run, but that disappears over time. I didn’t train on the treadmill for the marathon because there’s a 30 minute limit at the gym. I didn’t want to get nasty looks from people waiting to run, so I did distance runs outdoor. [laughing] Is it difficult transitioning from the treadmill to the road? No, but you need to do both. The treadmill is great for speed work but your muscles need to get use to running outside to avoid injury. How did you do this past race? I finished one minute slower than the Polar Dash, so I was a little disappointed. I’m blaming the poor time on my costume [laughs]. That will make me feel better. I started burning up in my costume around the 4th mile. The headpiece was so large that I was running into a lot of wind resistance. Now that I think about it, I should have used it as a sail and worked with the wind rather than against it. Otherwise, it was pretty fun. I enjoyed seeing everyone in costume. The main reason I ran this race was to dress up, I didn’t care much about running. Your costume was incredible! The makeup was so intricate. Thanks! You know it was only $3 worth of makeup. I drew it on with eye pencil so it wouldn’t melt off my face when I started sweating. It’s oil-based, so it stays on your skin much better. What do you remember thinking about at the starting line? I was trying to decide which group I should run in. I wanted to finish an hour and fifty minutes, but didn’t know how much the costume would affect my speed. What will you remember about this past race? The people. A lot of people came up and gave me compliments on the costume. It was nice talking to so many different people. They were all wondering how I ran in costume. What do you like about running? I like the mental clarity and not having to count calories. I’ve always had a foggy mind and had a hard timing focusing. I wondered if there was something wrong with me or my diet. I could never figure it out. After I started running daily for a month, my mind became sharper and I didn’t feel so tired. That motivated me to keep running. As a female, I’ve always kept an eye on my weight. Since I started training, I no longer worry about restricting calories. I can eat whatever I want. I’m also eating more nutritious foods, which helps with the mental clarity. Has running had a positive effect on other parts of your life? I’ve noticed I’m a lot happier and much more patient. It’s helped me realize that small increments can amount to something much larger. I’m one of those people that gets overwhelmed when I see a huge obstacle in front of me. Running has helped me sit down and take on those obstacles bit by bit. Do you ever run into the wall? No, not at all. If I find myself slacking in a race, what I’ll do is clap. It’s weird, but it gives me a boost and acts as a power-up. I try not to clap too loud, where people start looking at me weird. [laughing] What do you think about when you run? To be honest, I’m usually focused on running and don’t pay too much attention to my surroundings. Sometimes I’ll check to see what mile marker I’m at. Often times I’m flipping through my iPod trying to get a good rhythm going. I remember getting a big boost of energy at the turnaround this past race. That died out within a mile and I was like, “No! No! No!” I had to push through so I just stared at my shadow and chased it to the finish line. When do you find running challenging? When I feel like being lazy. I found out how good I am at creating excuses and procrastination. When I get caught up in those weeks, I remind myself how much happier and awake I’ll feel when I’m done. You can’t slack, otherwise you’ll pay for it later. What do you remember when you crossed the finish line? I was wondering if my makeup was smeared. I’ve never ran 13 miles with that stuff on before. I also remember being very, very thirsty. I never drink or eat anything during the race. Not at all. Even during the full marathon, people were yelling at me because I was walking. I just turned up my music and put my sunglasses on. It makes me feel happy and energized. Would you call yourself a runner? I guess so. At what point do you become a runner? Great question. How would you define it? I’m a runner when I’m running. What advice would you give someone new to running? Runners just starting out often run too fast, too quick, and burn out. Their throat starts hurting, get red in the face, and their confidence deflates. It takes away from the joy of running. I would suggest slowing down and working your way up to a good distance. Hit that distance, then work on your speed. If you can talk without having to take heavy breathes, that’s a comfortable pace. You want to push yourself, but you don’t want to push yourself too hard. Running gear, you can’t live without? My ponytail, believe it or not. I could run completely naked and the one thing that would piss me off is my hair. I have pretty long hair, if I run without a ponytail it starts collecting sweat and sticking to my face. It’s not pleasant. I’d rather run naked with no shoes than run without my hair in a ponytail. 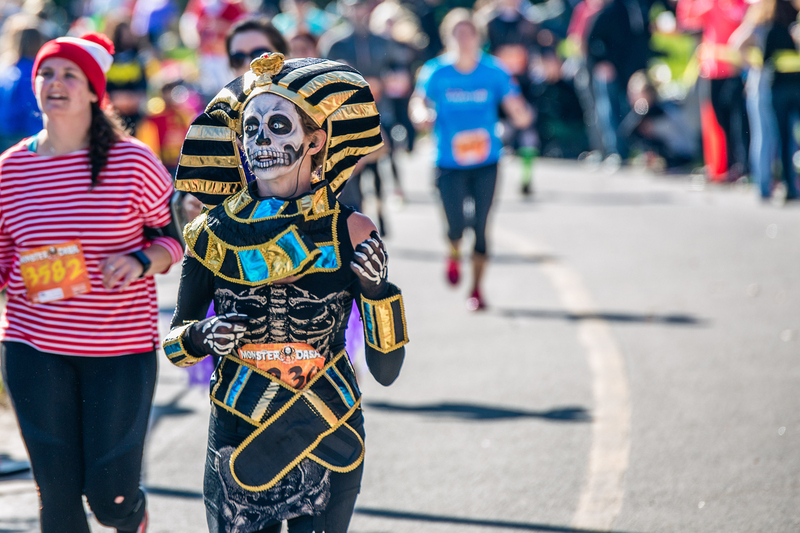 What’s the best costume you’ve seen at a race? The Baker’s Dozen is a personal endurance project by Edwin Lee and David Ofori-Amoah. We hope the BK12 challenge inspires others to do the things they’ve always wanted, but never found time for.